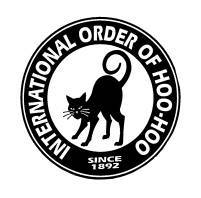 The Concatenated Order of Hoo-Hoo was founded as a “fun” fraternal society for men involved in the lumber industry. Called today the “International Order,” it is principally American and publishes the Hoo-Hoo Log and Ta1ly Magazine quarterly. There were 7,300 members in 1994. The founding members were not just lumbermen. They also included railroad men (who transport lumber) and newspaper men (who cover it with print). The organization chose as its emblem a black cat, to show its disdain for superstition, and based much of its ritual on the cat’s nine lives. Their officers were the Supreme Nine, made up of the Snark, the Senior Hoo-Hoo, the Junior Hoo-Hoo, the Bojum or Boojum, the Scrivenotor, the Jabberwock, the Cuctocacian, the Arcanoper, and the Gurdon. The overall leader was the Snark of the Universe. One of the high points of the ritual was the Embalming of the Snark, by which process he passed into the House of Ancients. The theme of nines was continued. In 1937, initiation cost was $9.99; annual dues were $0.99, and the constitution originally limited membership to 9,999, though that was subsequently changed to 99,999. There are also nine Ethical Principles, though it is not clear whether these were a part of the original conception or a subsequent addition as the order matured into respectability. In 1909 (appropriate enough), it started down the slippery slope to seriousness with a funeral fund (raised by a $2 assessment against 3,000 members), which was fraught with actuarial loopholes. The relatives of decreased members were paid $250, which was no mean sum in 1909, and when the reserves fell too low, there would be another assessment. In the absence of medical examinations and age limits, the Concatenated Order was playing actuarial Russian Roulette. The next change, therefore, was a requirement that no death benefits were payable for the first 60 days of membership. In 1965, it threw out the “Concatenated” part of the title as being outdated. By the 1980s, it had so far forgotten itself as to dedicate itself to the promotion of lumber in many ways: by sponsoring exhibits at state and county fairs, paying lecturers, giving scholarships, giving awards for carpentry in vocational schools, and sponsoring tree-planting projects.